Hearing the best operas and concerts in the world: Priceless. Since arriving in Vienna on January 8th, I’ve been a regular at the Vienna State Opera, the Staatsoper. And while I’m obviously fascinated by the wonderful music making that happens inside of this historic site, I would like to share one of my favorite bits of Viennese history. The comical story of this building, the first one on the Ringstraße, includes incredible public criticism, the suicide of one of the architects, and an accidental bombing. In short, Eduard van der Nüll and August Sicard von Sicardsburg began constructing the Staatsoper in 1861 in an Italian neo-Renaissance style which caused a great deal of public unrest (basically everyone thought it looked like a military building). Van der Nüll henceforth committed suicide, von Sicardsburg died of a heart attack, and neither saw the building completed. Ironically, the building was later mistaken for a military refinery and was severely damaged by American bombers. Of course, as you can see below, the reconstruction adds an magically antiquated character to the Ringstraße, without the facade of a military structure. 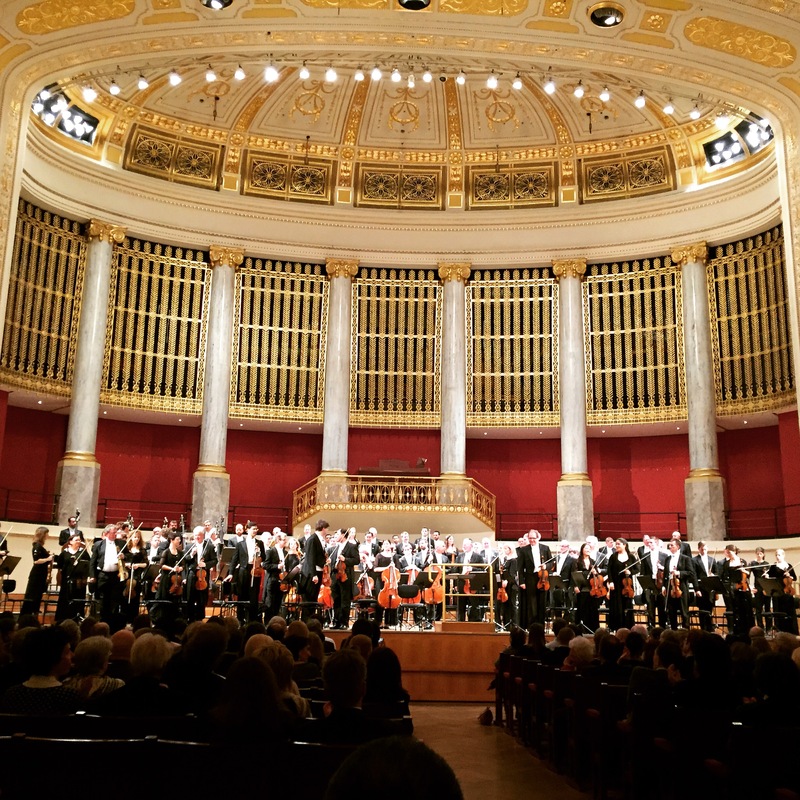 To begin, I am thoroughly encouraged by the state of classical music in Vienna: music lives at the heart of this city and in the hearts of the Viennese people. Every concert and every opera I’ve attended has been sold out, and Stehplatz (standing room – think leaning on a bar for the entirety of an opera or concert) is an all-out battle to get a good spot. And while I have surely seen 50 shades of grey at each concert and opera (sorry, bad joke), I find myself standing next to other young adults, families, and teenagers, all eager to hear spectacular music. I imagine returning to the American classical music scene will be difficult, but I’m hoping this experience will be inspiration for me to get involved in bringing classical music back to life in America. 1. Pique Dame. Tchaikovsky. Staatsoper. Written only two years before the Nutcracker, this overly-dramatic story of false love, gambling, and cross-dressing left me confused, slightly disturbed, and awe-inspired by Tchaikovsky’s melancholic harmonic character and stunning vocal writing. 3. London Symphony. Mahler 4, Ravel Piano Concerto in G. Konzerthaus. Mahler is a God here in Vienna, and London surely did him justice. As a horn player, I can’t hear this pastoral, transcendent, and heavenly work without a visceral, emotional response. There is something so inherently human about Mahler’s symphonic idiom and I would recommend Mahler symphonies to one and all. 4. Salome. Strauss. Staatsoper. For a comprehensive plot summary, see Mark 6:17-29. Yes, the story of Salome is indeed that of the beheading of John the Baptist. With one of the most spectacular, colourful sets I have ever seen, this opera twists an already dark and disturbing tale with Strauss’ programmatic, descriptive writing. Quite entertaining to say the least. 5. Tonkünstler-Orchesters Niederösterreich. Rachmaninov Piano Concerto No. 2, Tchaikovsky 4. Musikverein. Watching master pianists is like watching Cirque Du Soleil. They both seem utterly impossible and almost other-worldly. And Rachmaninov’s uniquely Russian sound is the perfect vessel for such astounding talent. If you haven’t heard Tchaik 4, I would fix that ASAP, especially if you’re a Romantic music lover. My love for the work began in a small, soundproof box, where I spent hours perfecting the famously bombastic horn opening that is guaranteed to be on every audition list…ever. 6. Schwanensee (Swan Lake). Tchaikovsky. Staatsoper. Just think Fantasia and you’ll recognize this iconic Russian ballet. Vienna isn’t particularly known for it’s ballet, but I’ve always wanted to see Swan Lake live, and the Staatsoper stage makes for an enchanting ballet. Klara – my awesome Austrian twin-friend who is the reason my blog exists – came with, making the night a real treat for me. 7. Il Barbiere di Siviglia. Rossini. Staatsoper. Last one I swear. Talk about Coloratura (elaborate colouring and “running” of the vocal melody – listen to Cecilia Bartoli for examples) – I’ve never heard such vocal agility from one cast in my life. Isabel Leonard as Rosina would’ve been enough for me to drool over this performance. But of course, Count Almaviva, the lead tenor, also had my jaw practically resting on the floor. This opera buffa (comic opera) is immensely entertaining for any audience member, musician or not. I even brought two opera newbies (Klara and my friend Emi), and they concur: ergo, you should see it to. If you made it through all of this, you deserve a chocolate bar. Or a Käsekrainer. Or a ticket to the opera, since they’re all about the same price! (Crazy right?) Now enjoy some pictures. Tata for now!